Traditional thermal cautery uses heat from direct current to cauterize living tissue and limit bleeding at the incision site. 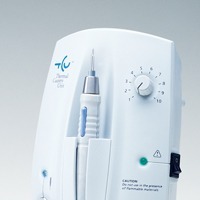 Thermal cautery eliminates the possibility of alternate site burns that can occur with electrosurgery. Electric current never enters the subject's body. WPI's Thermal Cautery Unit provides all the cautery power necessary for treating numerous minor surgical conditions in a research laboratory. Our thermal cautery units are ideal for dermatology experimentation, ENT and plastic surgery applications, or any procedure that requires accurate hemostasis. This micro cautery unit is designed for use in a research laboratory. Looking for a particular Bovie part number? Find the WPI part number of a Bovie instrument.